The Playmakers: "Team Means Family"
To support Coach Roz and the Playmakers, join them at their annual BBQ dinner on April 28. Visit theplaymakers.org for more information. 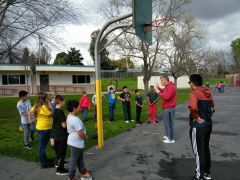 Coach Roz and Peter Francisco teaching the Playmakers of Skycrest Elementary how to properly run basketball drills. That is the first of the four core values in the Playmakers Creed that program founder and executive director Greg “Coach Roz” Roeszler instills into his student athletes from day one. Established in 2009, The Playmakers Organization is more than just an after school program, it’s a family. Family, followed by Academics, Serving Others and Winning With Honor. There are three components to the program: Character and Leadership, Reading and Literacy and Sports and Recreation. 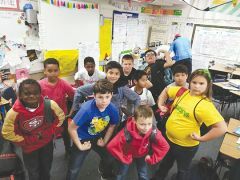 “The program is about integrating sports with character,” according to Skycrest Elementary 5th grade teacher Jinne Calvi. Skycrest Elementary in Citrus Heights is just one of four current locations that the program is currently serving, along with schools in Rancho Cordova, Folsom and Woodland with expansion to Antelope and Rocklin on the horizon. With Coach Roz in charge, the program is facilitated by Sacramento State student-athletes and fraternity brothers. Sac State senior and former Phi Kappa Tau president Alec Romero has been working with the Playmakers for three years and has become Coach Roz’s right hand man. He manages the rest of the coaches and has dedicated a lot of time and hard work to help make the program what it is today. Fellow Phi Kappa Tau brother and Sac State sophomore Peter Francisco is the newest coach and had only been on the job for a couple of days but was already leading the charge on the basketball court, running layup drills and teaching the Playmakers how to both follow directions and compete. The program starts off in the classroom after school with the Playmakers doing their homework then openly discussing anything that may be on their minds. The coaches are there for them and help guide a very structured but free speaking conversation. The class then transitions into a few warmup exercises before heading outside, in a single file line, to play whatever seasonal sport they may choose. Coach Roz teaches the idea of what he calls the “reverse pyramid.” This is the counter sports culture idea that the veterans and leaders of the team actually go last, rather than first. “Pups, seniors, leaders,” Roz explained. 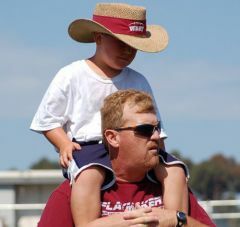 “In life, you earn the right to go last.” This prepares the Playmakers for the idea that sometimes in life you must put your family first – something that Coach Roz and his team are teaching by example. It is clear that the Playmakers are more than willing to learn and in return lead, but just need that extra guidance from the likes of Coach Roz and his team. While it’s not always easy, by the end of each new concept, both on and off the court, everyone is on the same page and working together as a team – and team means family. To support the Playmakers, join them at their annual BBQ dinner on April 28 from 6-9pm at the Divine Savior Church located at 9079 Greenback Lane in Orangevale. There will be a number of guest speakers, a tri-tip dinner and drinks, entertainment for all and a silent auction. Tickets are $40 and available at theplaymakers.org.